An end to extreme wealth by 2025. 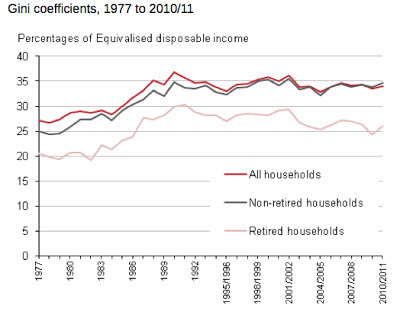 Reversing increasing extreme inequality and aim to return inequality to 1990 levels. Global inequality, the only form of inequality that a good little liberal should be concerned about at all, has fallen over the years. 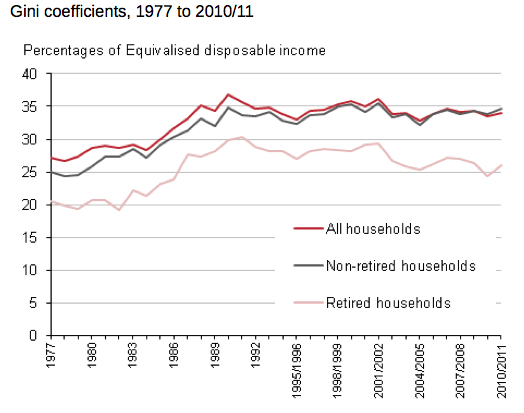 "In the UK inequality is rapidly returning to levels not seen since the time of Charles Dickens." No doubt many people believe this, but as this graph from the Office for National Statistics shows, the Gini coefficient, the standard measure of inequality, is not rising—let alone rising rapidly. There hasn't been any real rise in inequality for the best part of a quarter of a century and inequality is lower today than it was in Oxfam's hallowed year of 1990. Job done, then. Next. You'd think that Oxfam would take five minutes to check widely available statistics before pontificating on a subject. I'm sure it was an honest mistake. The alternative explanation—that they made a conscious decision to mislead the public because they're a bunch of lying leftards—is too horrible to consider. They've done the usual thing of saying that the usual measure of something isn't accurate enough so they've adjusted it by using some other measure whilst still using the original definition. So Gini is used to measure inequality. But its not good enough for Oxfam so they include some other factors. They then ignore the fact that they aren't really showing inequality as defined by everyone else but their own made up version. I gave up donating to Oxfam years ago. There are many better charities that spend much larger proportions of their funds helping people. Sadly, well intentioned Oxfamites are taken in by this economic and environmental hogwash. In their blinkered worldview all that is needed for a perfectly happy world is the seizure of 'excess' wealth and its redistribution to the deserving poor, as determined by the elite policymakers. We should perhaps gently point out to them that various unfortunate parts of the world were subject to that experiment in the last century and things didn't turn out too well for them. Reality hasn't worked out too well for leftists lately -- you can hardly blame them for abandoning it and retreating to their own constructed world. Just another example of sock-puppet new-speak.